Teachers are using the laptops in a variety of ways, and most often in developing instructional materials, conducting research related to instruction, and communicating with colleagues. Teacher usage is 20 to 30% higher for teachers with more advanced technology skills, and higher for teachers who have participated in four or more professional development activities. Students report using the laptops most frequently in finding information (90%), organizing information (63%), and taking class notes (57%). Student usage of the laptops for completing class work is higher for students who may take the laptops home. Over 70% of the teachers surveyed reported that the laptops helped them to more effectively meet their curriculum goals, and individualize their curriculum to meet particular student needs. Over 75% of the teachers reported that having the laptops helped them better meet Maine’s statewide learning standards, the Learning Results. More than 4 out of 5 teachers surveyed reported that students are more engaged in their learning, more actively involved in their own learning, and produce better quality work. More than 70% of the students surveyed reported that the laptops helped them to be better organized, to get their work done more quickly, and with better quality. Teachers reported that all types of students are more engaged in their learning and more motivated to learn, particularly at-risk and special needs children. A sample of ninth grade students who no longer have laptops reported that they get less work done without the laptops, and the quality of their work has declined without the laptops. Teachers and principals reported considerable anecdotal evidence that the laptops have had a very positive impact on student attendance, behavior, and achievement, although concrete evidence is still sparse. Teachers reported that the greatest obstacles in integrating the laptop technology more into their curriculum and instruction are the lack of technical support, the lack of more professional development opportunities, and the lack of time. Some teachers, students, and principals still report continuing problems with the technology, but these problems appear to have declined substantially after the first few months of the program. Superintendents reported some increases in costs with implementation of the laptops. 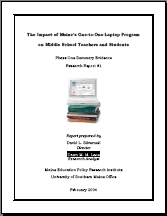 In summary, the evidence collected for this evaluation indicates that a large majority of Maine’s middle schools have successfully implemented the one-to-one laptop program, and there is already substantial self-reported evidence that student learning has increased and improved. Additional research needs to be conducted in the coming years to document and understand the long-term impacts of the laptop initiative on teachers and teaching, students and learning, and on schools.